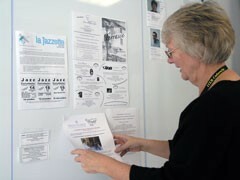 Jennifer Hay, ITER Public Relations, arranging the social program. With a good number of newcomers to the ITER Team, efforts are being made to make them feel at home in Provence and part of the "ITER family". Jennifer Hay in Public Relations is currently acting as a contact for social activities and is picking her local French colleagues' brains for interesting things to do and see and places to go. So far staff have been kept informed about classical music concerts, jazz evenings, karaoke evenings and the like. One trip being planned after Christmas is a visit to the prestigious chocolate factory at Puyricard, just north of Aix en Provence. This was the most popular excursion on the basis of a questionnaire sent out to the ITER Team, closely followed by wine-tasting (also to be arranged soon). A Christmas get-together making the most of cuisine from all around the world are also on the agenda.